It catches you unawares, when you least expect it. Those little things. I'll be in a shop and see a something that I know Daisy would like, would have liked, and remember that I'm never going shop for her again. No more trinkets from festivals, tshirts of her latest favourite character, no more over the top accessories or endless craft supplies. I keep finding little handmade cards and pictures, made for me over the years, tucked into a drawer or inside a book - sprinklings of glitter, scrawled marks on the paper which she would proudly announce to be either one of us, daddy, Pluto or her favourite “Ho Ho Ho”. They have stopped now. There won’t be any more cards. It's the end of term here and the shops are full of things to buy as thank you gifts for teachers. that's when it really hit me. 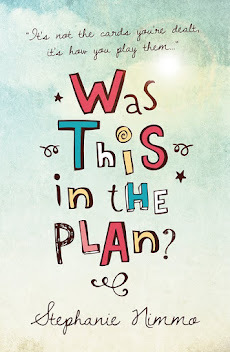 The end of the school year is such a finite point in time, it marks time moving on, a time of change. 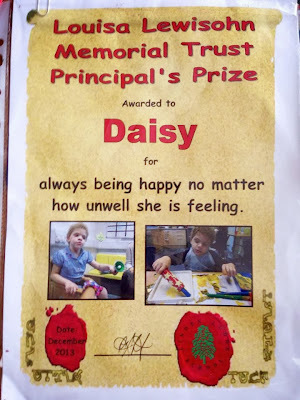 Daisy won’t move on, she won’t change class again, we won’t buy end of year gifts and cards to thank her teachers. Just as it didn’t with Andy’s death, time refuses to stand still. Daisy was barely able to go to school at the end anyway. The combination of needing the scarce resource of a nurse who could manage her complex medical needs together with her increasing frailty meant that the two days a week she was able to go to school often did not happen. 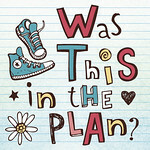 I had been looking at different settings, where there was more robust medical support in place and where she could potentially have some regular time at school. But realistically, would that have happened? The end of term would have been just as poignant if Daisy had still been alive, a continued sign of all the things she could no longer do. But it's the little things that make me sad. She loved sparkly, glittery things - being able to buy stuff that made her smile, seeing her take pride in a dab of glue and splash of paint on a picture, I miss that. I was in mourning for the loss of my girl before she died, it had been a couple of years since she had been well enough to appear in a school play. Sports day medals hang on her door form three years ago, there were no more after that. 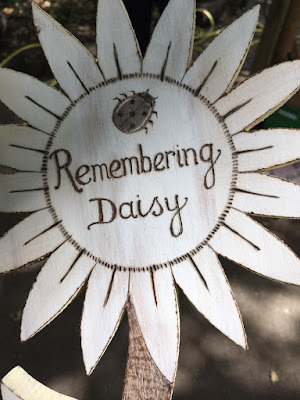 She was slowly deteriorating and I had already started to miss the Daisy we had before. She still gave us glimpses of it though, with her wicked sense of humour and her winning smile. A beautiful thing happened at the end of this term. I wanted to take some of Daisy’s ashes back to school and scatter them so that she would always be there. 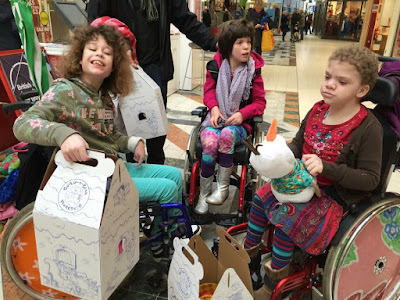 I took my friend along to come and choose a place to scatter them and we chatted about the friendships that children make at special schools. 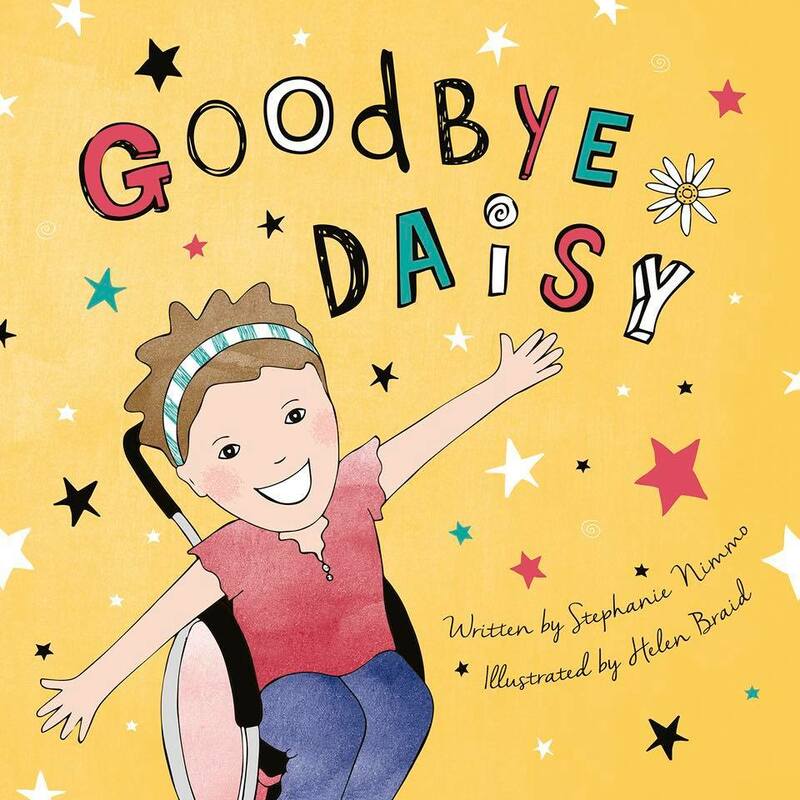 My friend’s own daughter had taken Daisy under her wing many years ago when they shared the same transport to school, Daisy loved her “big girl” friends. Izzy was now moving on, going “to college” as she put it, a new residential setting, perfect for her. We chatted about how we wanted to honour those friendships that were made by all of the children that pass through the school. 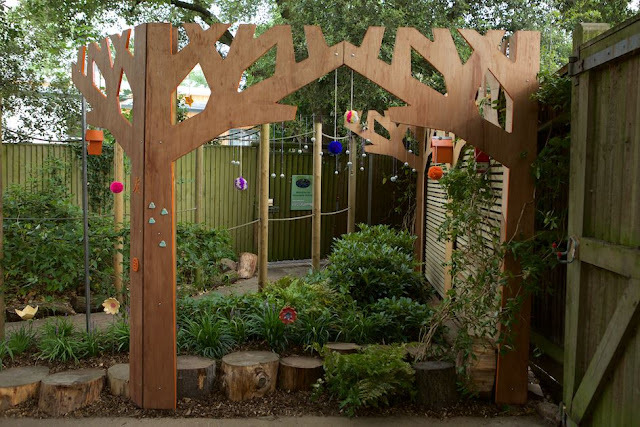 So the seed of an idea grew and so did a beautiful garden, designed by Izzy’s dad, who just happens to be an award winning garden designer, built by volunteers with donated plants and landscape supplies. The Forever Friends garden is situated in a peaceful corner of the school each of the children who were leaving to move on from school placed a pebble or memento in the garden. 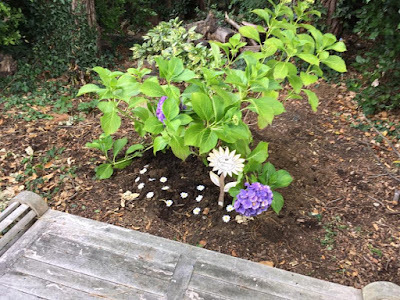 Izzy and her sister proudly placed a pebble with three names; Izzy, Elvi and Daisy. Three friends who had got to know each other at Linden Lodge, the two big girls taking Daisy under their wing. Friends who, when health worries allowed could still do that stuff that we take for granted with our other children – visit each other’s houses, go bowling, celebrate birthdays. You know, just be girls together. Izzy, Elvi & Daisy - a successful trip to Build a Bear! 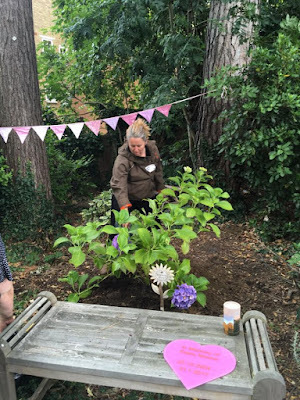 I took some of Daisy’s ashes back to school and we quietly gathered some of the people who knew her well scattered them in a tranquil space where the plaques honouring the children who had died are hung. A little robin sat and watched us as we talked about Daisy and how much she loved school, it was like she was with us. 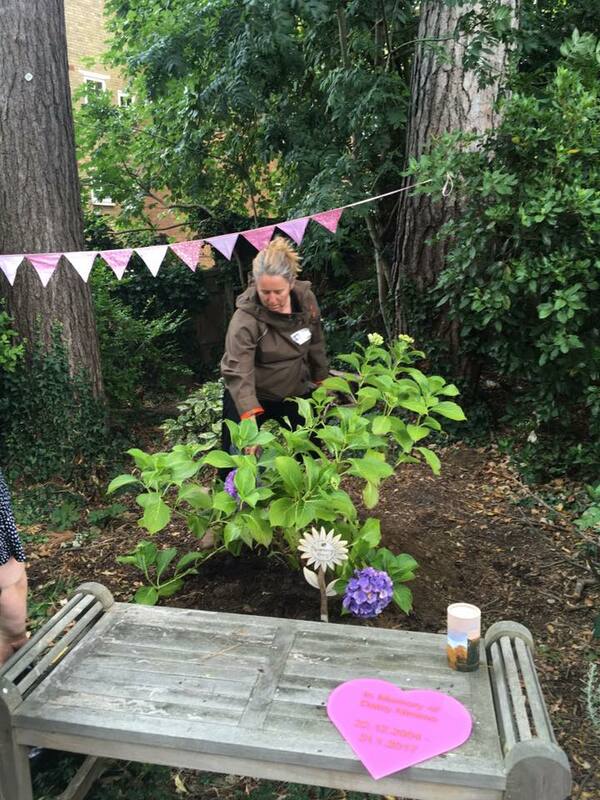 Elvi's mum Sam making sure the hydrangea has been planted properly! 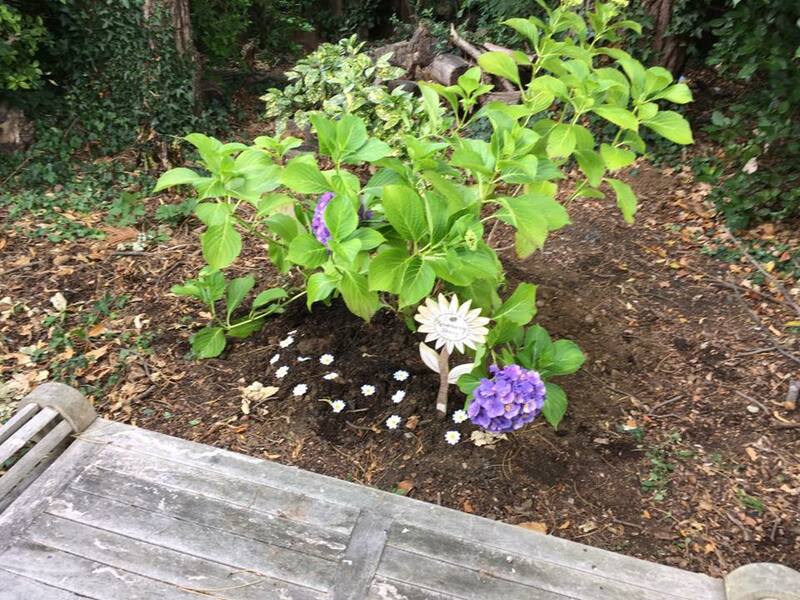 We planted a beautiful hydrangea where her ashes are and decorated the area with bunting and daisies – just as Daisy would have expected, accessories and decorations were essential as far as she was concerned! These ceremonies and moments of remembrance are important, they help me get through, they make me smile when I think of all those funny moments and happy times we had. I don’t miss the medical stuff, the stress, the pain and the worry but I miss my girl. She’s all around me and when I am out and about those foolish things that remind me of her are comforting. Patrick Collins is a Chelsea Flower Show Gold Medal Winner. 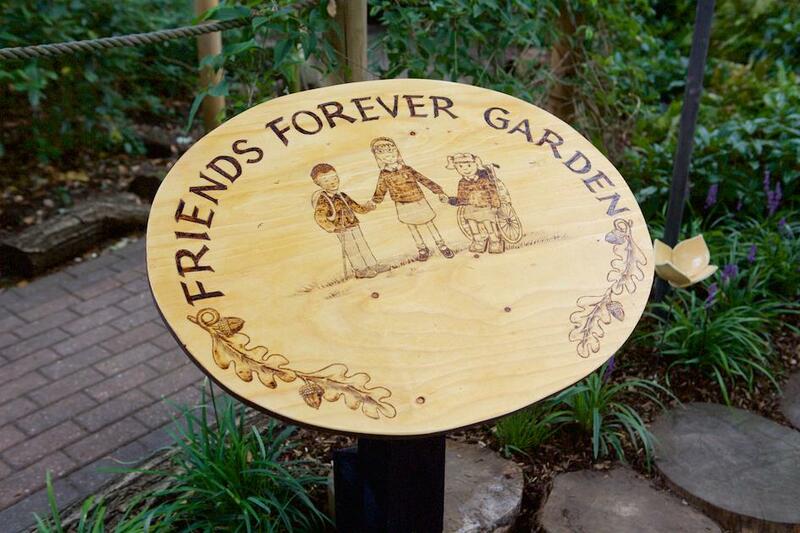 Thank you to him and to his wife Sarah for being the driving forces behind the beautiful Friends Forever Garden. 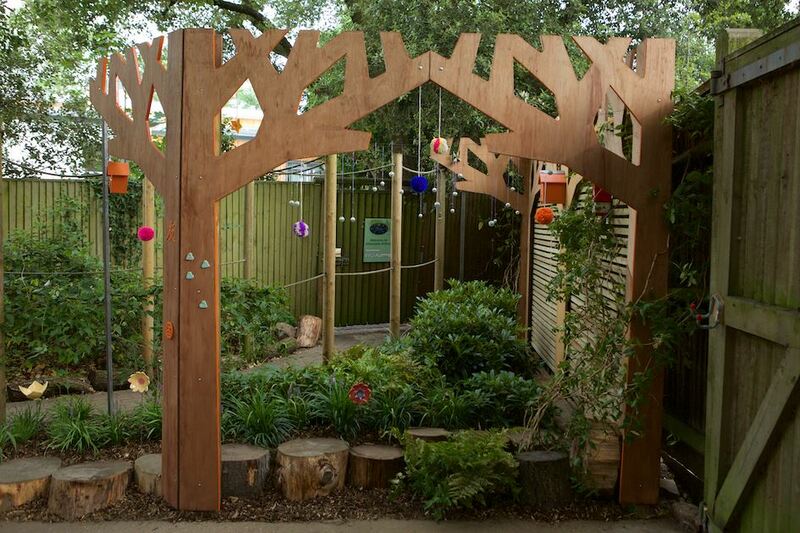 A beautiful legacy for their daughter Izzy and all the children who pass through Linden Lodge School - some leave, some get to stay forever, like Daisy.